One of the first articles that I came across was Paul Wheaton's article on rocket mass heaters. He does a good job of breaking down the technology in a way that anyone can understand. So, I am going to relay some of his information as well as some other details I scrounged up! 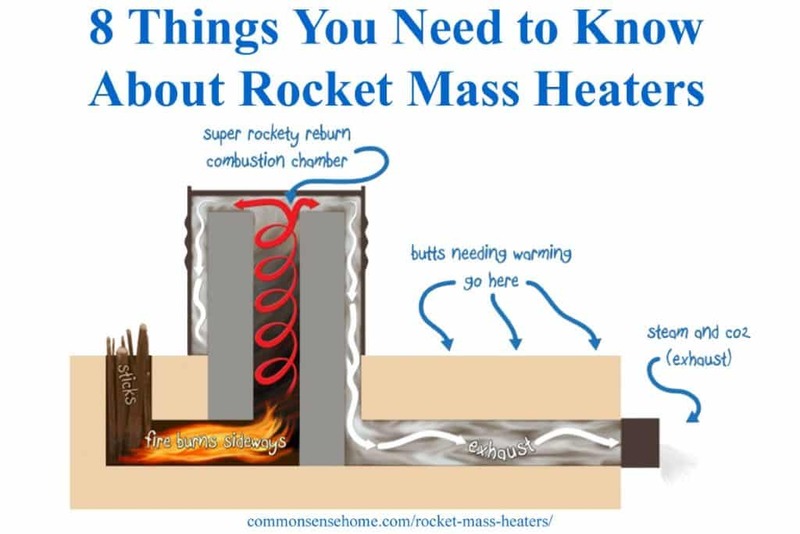 I want to tell you about several of the reasons why rocket mass heating is so important. Let’s jump in. They're more like super-efficient and super-comfortable masonry heaters, except that people are building them for a LOT less money. How do they do achieve this super efficiency you ask? Well, it has to do with the innards of the rocket mass heater. First, the sticks are put into the wood feed vertically. They are standing straight up. Then, only the bottoms of the sticks burn, and the fire burns sideways! How does the fire burn sideways? Well, because the heat riser in the barrel is so insanely hot, it creates a convective current that pulls the fire sideways into it. Next, the thermosiphon draft pulls the smoke from the fire up into the riser and into the barrel. The sharp turn mixes that smoke with fire so it burns up the smoke! Thus, only leaving a tiny tiny bit of CO2! It’s nearly purely steam. This process is illustrated in the photo above, from Paul Wheaton's article. This one surprised me, because natural gas is supposed to burn really clean. I didn't know wood COULD burn that clean. It can, if you get the fire hot enough; wood can burn completely down to steam and CO2 just like natural gas does, with a little bit of mineral ash left over. Did you ever crouch over the heating vent in your nightie or pajamas, trying to get warm enough to get dressed? Good way to be late to school wasn't it? Moving hot air around is not an efficient way to heat things – air doesn't hold a lot of heat, plus it causes evaporation which makes you colder. Forced-air heating is pretty inefficient, the only reason we do it is that it's relatively easy to control with thermostats and vents, and not as dangerous as steam heat. Warm and comfortable in a canvas tipi in the middle of winter. Radiant heat transfer happens when warmth radiates from a hot surface to strike another surface. It doesn't require air movement. Examples include warmth radiating from a fire or from the sun. 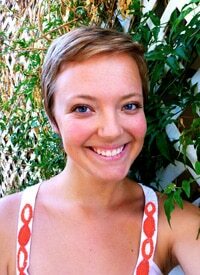 Cassie Langstraat is a writer who grew up under the big blue skies of Montana. She recently got her B.A. in English from The University of Montana and has headed out west to try out California life. She is a very passionate person who has a fire in her soul for all things regarding literature, permaculture, and feminism. When she isn’t vehemently writing or poking around in her garden, she enjoys reading heady philosophical novels, going fishing in the dark, and eating cheeses with names she can’t pronounce. I’m quite familiar with rocket stoves and variations on that theme because I’ve built several. I just wanted to let you know how much I appreciate the this clearly written piece on the subject. Well done. in a RM heater: How is burn rate controlled? By the amount of wood burning at the time? increasing burn rate. On RM how is this handled? With our masonry stove (which is similar), there is no controlling the burn. The goal is to burn as hot and fast as possible, and then close down the chimney and fresh air feed, trapping the heat in the masonry. The masonry then slowly emits the heat over time. Ours stays warm for over 24 hours, but we burn twice per day in cold weather to boost the output as high as possible. It’s not recommended that we burn any more than this, as there is only so much thermal capacity in the masonry. and I’ve checked the max temp at 1050 max using my infrared thermometer. and had to replace it yearly. has used the designed long emough to get a feed back on what problems lay ahead. many interested in RM because it’s not insurable or meeting building regulations. the roof level but above all else under it. I like that idea as an alternative and forget the mass feeding continually with pellets. but using the burn chamber. A lot of alternative building techniques have a tough time meeting code/getting insurance. Of course, many willing to build that way are also inclined not to have insurance/be off grid/unregulated. The IR tube transfers heat well to the rest of the building? It doesn’t just give a hot spot near the ceiling? What about carbon monoxide? Is that an issue in a well insulated home? I guess you safe a lot of fuel, but its still an open fire in your home. Has anyone experience with this issue? I don’t have a standard rocket mass heater, but I do have a masonry stove, which is similar, and it’s no noisier than a normal fire. The sound is hard to describe. It’s not exactly noisy, it’s just the sound or air being pulled into the pipe, and the burning wood crackling, which in the case of my BBQ grill is a six inch pipe. You could almost compare the sound to a woodstove door left wide open while the fire is burning inside it, but as the fire area of the “J” is so much smaller, the sound is less than that. Also less noisy than say, an open fireplace, again because the fire is much smaller. build me a rocket mass heater from start to finish. bench. I live in Colorado. I’m a novice in the rocket mass community, but hopefully some others who are watching this comment thread may have some suggestions. Did you ever build your RMH? I live in Black Forest and am curious. Thx! I live in Black Forest, CO and am slowly building my dream after total loss of my home during the 2013 wildfire. I plan to build one, hopefully in the coming year and hope to offer a shared experience. There is a healthy group of similarly-minded folks around. Stay in touch, please. Any others nearby? I am slowly rebuilding after losing my house in the 2013 Black Forest (Colorado) fire. I hope to give this a try and am willing to share my experiences. Any others nearby interested in collaborating? I am an engineering intern will help with rocket mass stoves. Great article. I haven’t made a heater yet, but have used the “J” to make a great BBQ grill. It’s a “J” made of black sheet iron stovepipe with a BBQ grill at the top of the J supported by a stand, and it’s inside a woodshed that is covered by a roof but is mostly open to the outside air. I use kindling sized wood and dried plant stalks as fuel and grill every Sunday for me and my GF. The unit works great. Getting it to draft is tricky sometimes until the “rocket effect” starts, then it’s great from then on. We have a similar effect in our Tempcast masonry stove. The draw isn’t terribly strong until it gets up to temp. I’ve seen RMS idea applied to greenhouses. Why not move that heavy COB mass to the basement and take the heavy load off the floor? You could raise the heated mass to 160-200F reducing the mass. And draw off that mass as needed. Use water instead. set up like a hot water boiler system? 500 gal insulated water tank x 8.34 x 90deg could allow 15000btu/hr for a whole day. use (2) 275 gal fuel oil tanks. Plus use a power vent system if needed. Still the RM heating part to get a clean burn. I think the most important part is to burn all the fuel completely before any heat is passed to a heat exchanger. Chimneys depend on temp difference from top to bottom for a draw. I prefer a stainless steel ceramic wool wrapped. min mass to warm up. I don’t know min temp needed for a good draw but I’m searching. in their flue. i think it could be setup with a bimetal coil to automaticly control min flue temp. with heat tubes welded in to heat the water. I have a rocket stove that has a pellet hopper and is gravity fed. I love it. It heats my home easily. I’m 72 so chopping wood is out of the question. My stove is able to burn sticks 2 1/2 ft long by up to 2″ around. But with the hopper set in the feed tube it holds a bag of pellets and lasts 24 hours. It doesn’t have the heat mass to radiate heat but each style has its strengths. For this great grandma my heater is perfect. It has the double walled heat collection chamber. Its fabricated of Harvey metal. It can draw air from indoors or with pipe added it can draw from outside. The flat top of the outer chamber is 16″ across. I keep 3 gal of water hot on top and I can heat food or cook on top. At the side of the burn chamber there is a wide metal lip where I keep a tea pot warm on one side and a tall 2 1/2 cup covered pot of coffee or soup repeats. I keep an old small mental roaster to catch ashes in when i clean the burn area. This stove is sold with a long handled scraper to clean out ashes. If my home is cold when i start a fire I have a 7″ fan that I turn on to blow on the heat chamber and start moving heat through the home. At -16 this winter my mobile home (16×56) stayed comfortable. Thanks for this useful info! I like the idea of a gravity fed pellet situation. I like switching to continious pellet feed idea. regular RMS design sound good till I realize I ‘m going to chop the wood smaller. Feed it oftener. Cause there’s not enough mass to store enough heat all night. Sedore stove Canadian, and Tarm boiler made New England area. both top feed and bottom burn sideways. And use secondary air to complele combustion. As far as the claim it saves wood compared to what ? A fireplace ? I give credit to the newer stoves (Vermont Casting line) having a much higher effenency the the old style. I seriously doubt RMS claim do much better. Factories using coal. Power it to dust and blow it into a fuelized chamber not air controlled but fuel controlled. burn very effecent. I have been looking at RMH for some time. We recently moved into a house with an brick fireplace that has what I am guessing is a mass heater on the side. At one point the fireplace had a gas insert installed. I am wondering if this fireplace could be converted to a RMH. Can anyone lead me in the right direction? I’d tried inquiring with a local heating contractor to identify what’s going on with your unit, or searching for rocket mass groups in your area. Offhand, that doesn’t sound like an RMH setup, but it’s impossible to say without being able to look the whole thing over in person. i love the idea of building a rmh in the cabin i’m starting but i don’t have room to build a bench like most of these show do you have any sugestions? You could use it for radiant heat flooring. There are variants that use a masonry (brick) “bell” which is basically a hollow area in which the hot air stratifies with its exhaust at the bottom of the bell. These can be built vertically and have a footprint of approx. 2.5 x 3.5 foot and about 4-5 foot tall. It’s like standing the bench on end. Care should be taken in the area of initial exhaust area using firebrick. Internal routing of the hot air inside the bell would first go through the firebrick/refractory cement area and be cooled enough so that common red clay brick (not cement brick) will be used for the outer walls of the bell. I am investigating turning a small horse lorry into a tiny house, and wondering if it would be possible to incorporate a small version of a Rocket Stove fur cooking and heating such a small area, without using the cob? The trouble with what you propose is that to cook on a rocket stove without the oil barrel is that one normally would cook over the heat riser and you would end up with a smokey truck. If you had the barrel over the riser you could cook on the top of it and you would need to vent the exhaust from the base and take a stack out of the side [or roof] of the truck. You would be losing most of your heat that way as the point and effect of the mass is to retain the heat for a long time. If you just exhaust straight out most of the heat will escape with the draw up the flue. 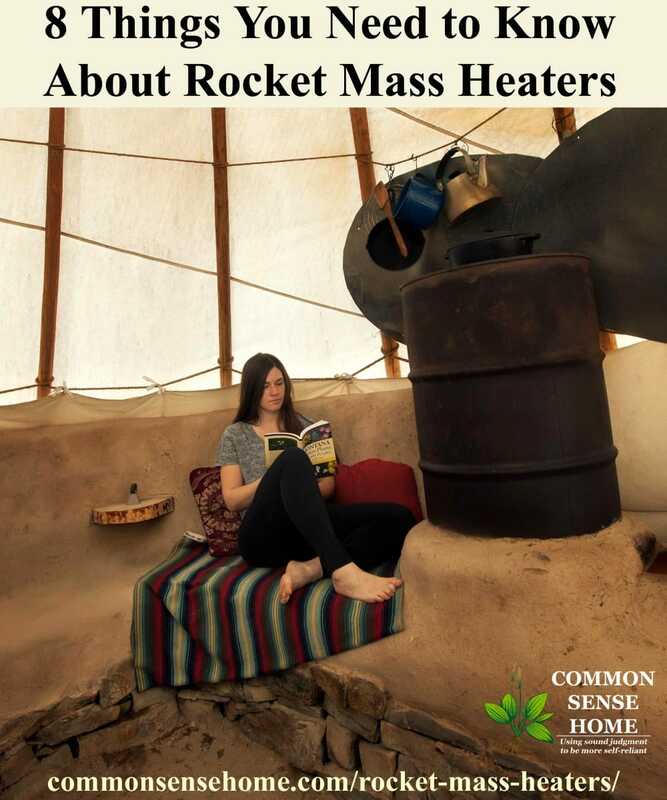 I love the rocket mass heater (RMH) concept. I hope to build one someday for my own home. However…. In the section #1, you erroneously state that RMH’s somehow mange to produce less CO2 and more stream which, according to the chemistry of combustion, is impossible. RMH’s more efficiently and completely burn the wood fuel AND capture more of the heat than conventional wood stoves. But the carbon in the wood CAN’T turn into water vapor (H20). It has to turn into CO2 or CO.
To state otherwise might suggest that a RMH has a smaller Carbon footprint due to less CO2 produced from the wood, which is incorrect. It might have a smaller Carbon footprint because it burns wood fuel more efficiently and captures heat more effectively resulting in less fuel used. I’m a little late to this discussion but would like to point this out: you’re right but unless its since been edited, the article only claimed “a little CO2” not “less CO2.” Nor does it claim conversion of CO2 to steam. Granted, not very precise but not the same as claiming what you describe. Also, the only fuels listed are renewable biomass therefore it doesn’t actually have a net carbon emission, basically no carbon footprint at all. I suspect that that is the line that George objected to. I think that because it’s the reason I came down here – to write a similar comment. The implication is that the smoke is burned up, consuming the CO2 and somehow converting it into steam. You don’t wind up with a tiny, tiny bit of CO2 – most of the mass of the exhaust gas is CO2 if you’re burning dry wood. A later line is clearer, but this one is messy at best. I also like the RMH concept. But let’s do some thinking here. All mass heaters have warm the mass first before you get warmed. you’re going to wait till the mass gets warmed up. Unless someone has keep it up. the more ridge the mass will be more brittle. We have a large masonry stove, and that retains heat for over 24 hours. Not sure about the heat retention on these types of units. When you say yours retains heat for 24 hrs. How many cubic feet of COB ? Take a infrared thermometer and give me some reading. The hottest and lowest temp of the mass. My masonry stove is a Tempcast kit with brick facade, no cob. Outside temp never gets so hot that I can’t comfortably touch it. I would estimate that hottest mass temp in the low 100s, and lowest mass temp is house temp because it’s in the center of the home. If you burn less wood, you create less CO2. It’s the most efficient way to generate heat from a fuel source, so it will produce less CO2. Could this heat a second floor if the rmh was on the first floor? Or how big of an area could it heat? Generally, most I’ve seen have been geared to single level/relatively small spaces. We have a traditional masonry stove in our basement, and very little heat reaches the main level from the stove. I see no reason why doing a ceiling duct to the second floor wouldn’t work. Those are some great pics of mine that were posted in this article of the rmh being built in the wofati we lived in montana. good information, great pics and video, I like the use of sheet metal and firebricks, thank you so much. Gary you bring up a good point cooling whether slow or fast condenses steam. So far I haven’t see any design with a water trap like power vent furnaces use but personally I would put one in. Rocket mass heaters, by their nature, tend to be very heavy. Load bearing capacity of the heater itself would vary, depending on materials used and how they are used. It is generally best to build them at ground level. An elevated build would need to be strongly supported. I think an average mass would be in the range of 3000lbs. That’s just the mass not the burn unit. How do you get the fire/draft started? Lighting the vertical wood with a cold stove and flue will caused the fire/smoke to back into the house? furnaces. Put it on thermostat control? I live in a residential neighborhood. Does anyone ever have legal problems building one of these for their home or shop? I am seriously considering one for my small shop, one reason is that the chimney regulations for a regular wood stove are really expensive to implement. You’d have to check with your local building code. My guess is that they would require any sort of combustion device to follow the same guidelines. I live in a cabin built on concrete piers; no way to retrofit a rmh inside. Can anyone think of a way to build the heater outside along an exterior wall and bring heat inside? The whole point of a rocket mass heater is to keep that hot mass inside the building, so putting it outside is counter-intuitive. If you could put supportive pilings at a similar depth to your current pilings, and put a load bearing concrete slab on top of them, you should be able to put a stove on top of that, but having it outside the building envelope – well, I probably wouldn’t bother with a RMH. The only way I see is cut out a hole in the floor and install a slab in the ground to support the weight above it . Seperated by standoff legs and insulated around those legs to minize heat flow from the weight above. Instead of COB I would be switching to a 275 gal fuel oil tank sitting above floor level and filled with water instead. The tank would have to be fitted with several heat ducts coiled inside. Why not build an extra room into your cabin and locate RMH in there? Thx for the nice article. I’m down with rocket stoves, totally, but I wouldn’t be happy having to look at something so ugly in my house every day. Do you know of any examples where they have been decorated or camouflaged to look nice? If so, I’d love to see some pics. As you mentioned, masonry stoves are expensive but they can also be built to be beautiful and blend in with a person’s chosen decor. I’m not sure if the photos in the post weren’t loading for you, but I changed some settings and hopefully you can see them now. You can finish a rocket stove in a variety of ways, as shown in the photos. I wonder what the ratio of the burn tube vs the discharge tube is. Also does the opening for the fuel/air supply need to be smaller or the same size as the discharge tube (aka chimney tube)? Any thought about ducting outside air in for combustion instead of using already heated inside air? PS do NOT allow bots or anyone else access to my name or email address please. You’d need to contact the rocket stove peeps directly for their specific design preferences. Unfortunately, they’re long since given up responding to comments on the post. Per my experience with our masonry stove, which has some common elements, we do use a dedicated fresh air feed. It has a standard 8 inch diameter pipe for air intake, which then travels down an interior wall and around the stove to wash the glass at the front of the stove. I think our chimney is also an 8 inch, because the stove is located in the basement so the chimney height is quite tall. I would like to build a double layered one, so bench along the bottom, then reading nook higher up. (I had seen a picture of one like this, I think made by a german company) would the bend in the exhaust pipe to get to the second level cause me problems do you think? Also could I then vent it up an existing chimney rather than a horixontal exhaust? Any tips would be greatly appreciated. The longer the run, the more potential for your fire to not draw as effectively as it should up the chimney. Venting up an existing chimney shouldn’t be a problem if everything is sized correctly, but you should really work directly with someone who has experience building these to make you you get your calculations right. The efficient burn does not reduce the amount of CO2 produced (for a given amount of wood). If anything it increases the production of C02. This is not a bad thing however, as the longer chain carbon compounds (smoke) are worse for the environment, and C02 is prefferable. I think the R.M. needs a few adjustments, if it will perform as they say. Why are they putting the cheep galvanized pipe in all that work. I would use something such as concrete tiles or pipe. A 55gal barrel will last approximately 10 years, if kept inside. The weather is what rusts them out and some stove pollish would help preserve them. I am planning to build one, they seem to be very economical. Seems they just need a little perfection. I have seen a video where an owner tried to bring in air from outside and regulate it with a homemade valve to the burn chamber, I read in the book RM heater builders guide [E &E] they speak of how critical CSA [cross sectional area] should be consistent to the successful operation of the RMH. so has anyone had success with bringing air in from outside as opposed to drawing air from the room? the video I saw was on youtube and this family built a earth bag home with the RMH. we are excited to build one for our shop/studio. we had hoped to have a masonry heater built but finances have been used elsewhere etc. and I am anxious to work with cob.